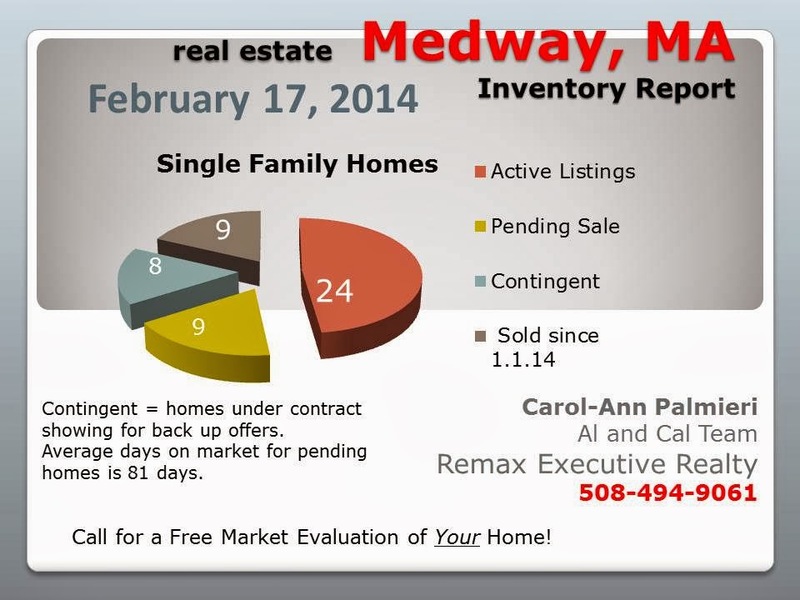 Looks like it's good news for single family homeowners in Medway MA. With a favorable 7.7 percent increase over the past year, Zillow predicts that this rise will continue over the next year, but at a somewhat lower rate of 2.5 percent. Of course this is a prediction, but judging by the amount of buyers hitting the pavement even in this extreme cold and traipsing through mounds of snow, it should be a brisk spring. Since Jan 1, 2014 there have been 9 home sales. The average sale price of $361,944 was roughly 98 percent of asking. There are just 2 homes priced below $250,000. Both of these homes are "diamonds in the rough" so to speak and are looking for someone to bring them back to life. $250,000 and $400,000. If you are in this range, there will be 9 homes (as of today) to choose from. The average price per square foot is $215. The least expensive of these is a 3 bedroom, 1 bath ranch for $259,900. On the high end, for $389,900 you can purchase a recently remodeled 4 bedroom, 3 bath colonial. There are 5 listings priced between $400,000 and $500,000. These include the "Cottages at Charles River Village" which are actually free standing single family homes in a condominium development. In the range of $500,000 to $600,000 you will find 8 homes. These range from 2300 (new build) to 5000 square feet. There is one home priced over $800,000 and one over one million dollars. Both will be custom homes in Applegate Farms. 17 homes are pending or under agreement with a contingency. Many of these home received acceptable offers in less than 30 days, some under a week. Currently there are no bank involved properties on the market in Medway. Since the beginning of this year, the homes that have been placed under contract /contingent homes represent all price ranges fairly evenly. Open house traffic is very active. Homes that are priced right and presented properly are receiving acceptable offers in a few short weeks of being placed for sale. Buyer activity is brisk, houses are going under contract. This suggests that the Medway market has leveled off; returning to healthy state. If you are considering buying a home in Medway, MA you don't want to sit on the sidelines for too long. Many listings are going under contract within a short time of being placed on the market. If you are a seller, pricing your home in line with comparable home sales will bring you an offer close to asking in a short amount of time. 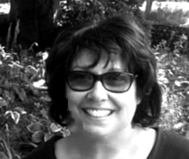 Visit my website to search for homes in Medway MA or to be notified when Medway homes come on the market. To find out what you home is worth in the current market email me or call 508-494-9061. A great local real estate agent is your best offense in negotiating the market. Regardless of what side of the fence you find yourself on, you need an agent knows the market and the neighborhoods inside and out. I have to say i like how and what you are doing with your home prices series in the various areas you cover. good job. The charts are very good as I said the other day. 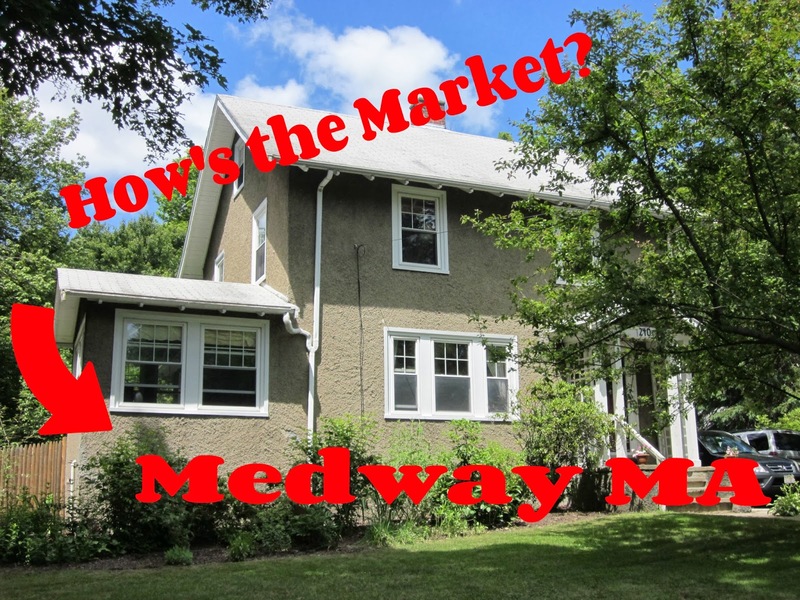 Cal, you know your Medway MA market so well and it is a tight market for sure with such limited inventory...a buyer needs you by their side! Hi Cal, I am just stopping by to say hello and I hope all is well with you folks. Have a great weekend. Hi Cal-sounds like a sellers market with very little inventory. That equals rising prices to me!